Word has been received with the passing of Kiki Koch, widow of DL Capt. Harry S. Koch III. Captain Koch, born 12-10-1934 and passed on 03-06-2009. He joined Delta Air Lines 12-17-1962 and was based MSY. Mrs. Koch was nearing her 76th birthday at the time of her passing April 14th. The family invites friends and family to attend a reception following services on the 26th at the home of their daughter Katie. Personal condolences may be sent to the family c/o Katie Saintcross, 9 Tara Place , Metairie LA 70002-1559. Arrangements under the direction of Tharp-Sontheimer-Tharp Funeral Home, Metairie, LA. Angela "Kiki" Koch died April 14, 2014 at the age of 75. With the loving support of Lakeside Hospice, she was able to be at home with her family. She is preceded in death by her devoted husband of 45 years, Harry S. Koch III. She is survived by her daughter, Katie Saintcross, husband Cullen, her son Harry S. Koch IV, wife Angela, and their son, Brady Alexander, her ultimate joy. Kiki had many loving friends who supported and cared for her. We are indebted to two beautiful women, Annaliza Borja and Dawn James for their unwavering commitment to her for the past several years. They had many laughs together. Kiki had an incredible desire for knowledge and understanding and was always exploring the internet, books and newspapers. One of the people she admired most was Albert E. Einstein and his quoted words: "There are only two ways to live your live. One is as though nothing is a miracle. The other is as though everything is a miracle." She was funny, smart, gregarious, generous and exceptionally loving. She exercised daily, attended ceramics regularly, loved going out to lunch or dinner and had become an exceptionally skilled knitter. Her death was a surprise to all who knew her and she will be missed dearly. We are grateful for the memories and she will live on eternally in our hearts and minds. A brief service will be held at Tharp-Sontheimer Funeral Home, 1600 N. Causeway Blvd. at 43rd Street, Metairie, LA on Saturday, April 26, 2014 at 2:30 p.m. with visitation beginning at 1:00 p.m. Kiki was also an exceptional host and loved to care for others and would welcome your presence at the reception following at her home. In lieu of flowers a donation may be made in her honor to Animal Rescue New Orleans, www.animalrescueneworleans.org , or the charity of your choosing. Condolences may be expressed online at www.tharpsontheimer.com Information 835-2341. 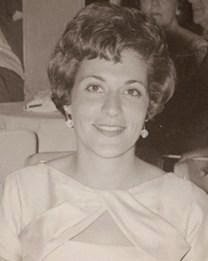 Angela Karagias Koch, widow of Capt. Harry Koch III (3/6/2009), has passed. Kiki's daughter Katie Saintcross lives at 9 Tara Place, Metairie, La. 70001 which is where the reception will be held. Kiki also has a son living in Metairie, Harry Koch IV (also known as Fritz). I wanted to let you know that my mother passed away suddenly. The funeral is next Saturday the 26th from 1-3 at Tharp Sontheimer and we arr having reception following at our home. The obituary will be in the paper and on NOLA.com on Wednesday and Friday of next week.